Choosing a best magnetic spin bike can be a daunting task with all of the brands currently on the market and you could easily make the wrong decision and buy something not worth your money. After a lot of research, we picked Keiser M3i to be the most suitable magnetic spin bike for most people due to it's features, build quality and the versatility. We have decided to review the top 5 magnetic spinning bikes and show you exactly how to use them and why they are great for you and your home. Many of them are expensive, but one thing we have all learned in life; is that must be willing to pay if you are looking to get the best. Spinning is a great way to get into shape and since it does not require you to work as hard as you would when jogging; it is one of the most highly rated ways that you could improve your fitness and lose weight in the gym. Spinning bikes are also available for the general public and you could easily get one for your home. They do not take up too much space and can be used at your own leisure as well. But, before we simply dive into the top 5 bikes for spinning, there are a few things that you will need to know before you set out to purchase one. We have compiled a decent buying guide that will show you exactly what features to look for and why these features are important. If you are looking to get the best value for your money, our buying guide should be the criterion that you use to judge the bikes. 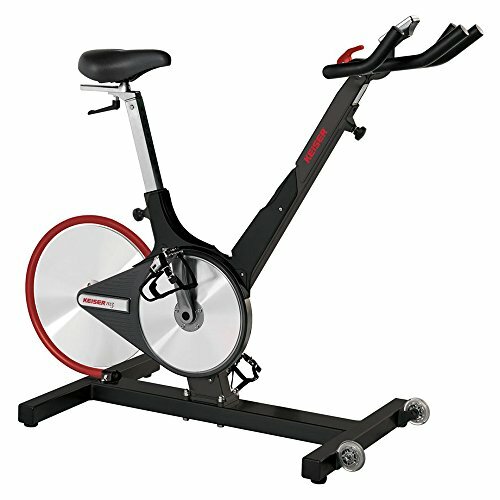 Best Magnetic Spin Bikes Today! What are magnetic spin bikes? Keiser M3i Indoor Cycle Black - Best pick! BodyCraft SPX - Budget pick! Before choosing a bike for spinning, you will need to choose the type of resistance that you want in the bike. There are two common types of resistance and both of these are quite useful. The first one is friction and this is the cheaper option as it uses a plate that presses down on the flywheel as you tighten the knob. The one downside to friction is that it might not always be consistent and this is why many people revert to magnetic resistance. Magnetic resistance works the same way as the normal bicycle you see on the road and it usually features two calipers on each side of the flywheel. Every time the wheel passes through this magnetic caliper, it will exert resistance on the wheel and the more you turn the knob, the closer these magnets come to the flywheel. If you want maximum resistance, the caliper will almost touch the wheel and this will exert maximum resistance due to the strength of the magnets. One reason why the magnetic resistance bikes are also great is the fact that you do not need to maintain them every now and again and nothing will wear. This will save you a lot of money in the long term. As we have already mentioned, choosing the best bike from all of the brands and sellers can be daunting, but if you do use this guide like we did to judge the quality of the bikes, you should get the best possible value for your money. Spinning bikes generally have 2 types of drive systems. The chain drive system is effective, but there is a lot of maintenance required and the chain might often have a few problems. If you decide to invest in the belt system, you will find that it is much more durable and also quieter. The belt system is also a little more durable. The frame of the bike can tell you a lot of things. The durability of the bike is determined by this as well as the stability of the bike. Having a durable frame made from a good metal will ensure that the bike gives you longer usage before breaking and it will also allow you to accommodate a higher weight limit. Even though many spinning bikes you find in the gym do not have consoles on them, we still highly recommend a console for the bikes at home. The console will allow you to track important stats and also monitor things like your heart rate. This will allow you to keep your heart rate in fat burning range and get the most out of every workout. If your bike can connect to apps like iFit and MyFitnessPal, that will be even better to keep track of your daily calorie intake and expenditure. In the gym, you will be motivated by spinning classes and the leader of the class, but at home, you will have to motivate yourself. Having a few decent workout programs will go a great length in making life easier for you and also allowing you to switch up between the workouts. This will keep the muscles on their toes and every day will be interesting. The bike might not always feel right and most of the time, you spouse or even the children might also want to start working out. Having a decent frame with easy adjustability is a must and this will give you some multifunctional use to deal with. If the frame cannot adjust, the bike might not work for everybody and once you stop working out it will be a waste of money. Assembling the bike can be tough if you do not have the right skills or the right tools. Luckily, most bikes will include an expert that can come in and assemble the bike for you, but this is a little expensive and you will save a lot of money if the bike can be easily assembled by you yourself. Sometimes the more intricate bikes will warrant an expert, but we do recommend considering the value of the bike before investing in an expert to help you. These features are what we consider to be the most important when choosing a magnetic spinning bike or any spinning bike for that matter. There are also 2 magnetic types of resistance, but we have not gone into great detail about them since electromagnetic is rarely found and basically works the same as the electronic magnet, but without any moving parts. That being said, here are the top magnetic resistance spinning bikes. Build: The Keiser M3i Indoor Cycle is a very basic, but still really effective bike that you can work out with. The bike has been constructed from durable metal parts and one of the best things is that since it is magnetic resistance, you will not have to worry about maintenance too much. Under the stabilizers, there are levelers for you to give a great workout without rocking. The bike is also incredibly smooth and there is virtually no noise when you are working out. In terms of the design, the bike is quite comfortable and you will have a huge handlebar with 4-way grips to use. This means that you can easily lean forward and get out of the saddle to stand and climb those mountains with rhythm. The bike comes with a belt driver, which gives you a smother ride than that of chain drive. When the belt drive is combined with magnetic resistance, the smooth drive and no maintenance will be there. Adjustability: The height of the seat and the handlebars can be adjusted. For adjustment, you need to loosen the knob, and put the poles in the right preset hole and tighten the knob. The bike can accommodate people from 4.10 to 6.5 ft height. This is very impressive compared to other magnetic spin bikes mentioned in this post. The handlebars can also be adjusted horizontally. Suppose when you increase the height of the seat, you can make the handlebars be near to you. The previous version M3 did not have this feature. But M3i has it. This bike has a magnetic resistance of 24 levels which can be adjusted with the help of the lever situated below the handlebars. When you adjust the resistance, it'll also be displayed in the console. As the bike comes with magnetic resistance, the bike is super-silent when riding. Accessories: The bike is also compatible with Bluetooth and you can easily connect your mobile device and keep track of all your stats and your heart rate. Even though this bike features an extremely sleek design, it doesn’t have the programs that you could follow built in. This means that you might get bored of the bike after a while. Luckily, the bike does have enough space for you to add a tablet and steam your own workout programs to keep things interesting for you and keep you motivated to shed off those extra pounds. In terms of pricing, the bike is quite expensive, but thanks to the value it provides, we still highly recommend the bike. All of the components of this bike is made in the US and you will, unfortunately, need to have an expert assemble the bike for you if you do not have the skills. With so few electronics, the bike might be more easily assembled than those with major consoles and multiple stat tracking features. 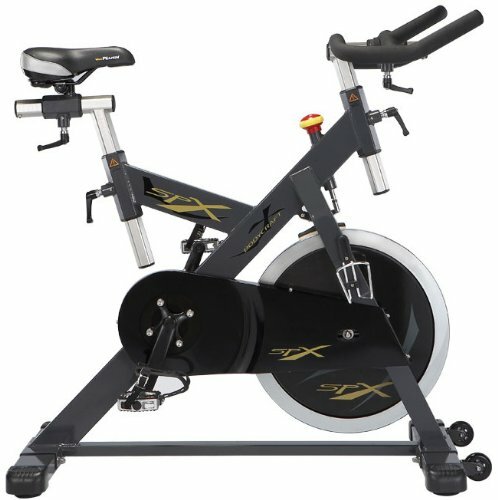 The BodyCraft SPX Club Indoor Cycling bike is a cheaper alternative to the above-mentioned version. The bike features 16 levels of resistance and this can be adjusted via the easy to use handlebars with multiple grip areas for you to vary your workout position. In terms of durability, the bike has been constructed from a durable heavy duty steel frame to show it durability. Build: Thanks to the 46-pound flywheel and heavy frame, the bike is extremely stable and will not easily shake or wobble. The bike will also maintain this stability and features a maximum weight limit of around 300 lbs. Our main concern is the adjustability and taller individuals might have some troubles with the low handlebars. There are also levelers attached to the bike to ensure that the bike won't rock while working out. Adjustability: Both the seat and the handlebars can be adjusted vertically and horizontally. In this regard the bike is very durable, and you can find the perfect posture for your workouts. The adjustment is based on clamps, so you can accurately adjust the the seat and handlebars. You are not limited by preset holes. The bike can accommodate the people of height from 5.2ft to 6.7ft. This may be a setback for short people below 5ft. Console and accessories: This bike also includes a very functional console and this console will allow you to track all of the relevant stats like heart rate and calories burned to ensure that you know how far you have progressed. What we do like about this console is the fact that it is not an additional app and is always usable on the bike. In terms of pricing, this bike is actually quite reasonably priced and will not cost you a fortune. The bike also includes a decent warranty and the frame will be covered for 10 years, while the parts are covered for 3. Due to the intricate console, the assembly process might be a little tricky of you are not good with electronics. The Keiser M3 Indoor Cycle Stationary Trainer exercise bike is much similar to the first bike from Keiser on our list and it is also quite expensive. The bike is designed from durable steel and the frames on the bike will never wear due to the magnetic resistance feature. Build: The bike also includes a stable platform and this will ensure that you do not need to deal with things like shaking and wobbling while you are working out. Adjustability: The handlebars cannot be adjusted horizontally similar to what can do with M3i and M3 Plus. Nevertheless, the seat is adjustable both vertically and horizontally. This adjustment can be done by putting poles in the preset holes. The resistance is magnetic, so that it ensures a smooth ride without any friction. The console gives you the level of resistance from 1 to 24. Preset resistance levels are of great help when you want to go back to the workout with same previous settings. Console and accessories: This bike also offers an additional console and you will not have the luxury of the app, but the console will track all of the relevant stats to ensure that you know exactly where you are at and how you have progressed. Unfortunately, the computer is powered with batteries and you will need to have it powered up if you want to track your stats accurately. This will be the only long-term maintenance. In terms of pricing, this bike is really expensive and you will need to invest in the console additionally. One thing that is great is the fact that the assembly process is quite easy and the bike is really quite and smooth when working out. We highly recommend this bike for people who are serious about getting back in shape. 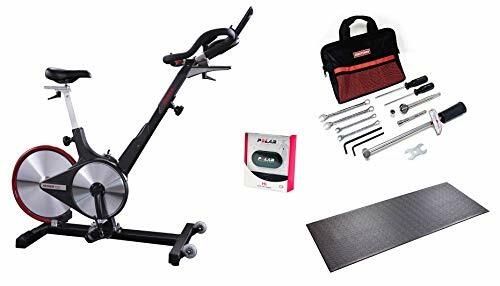 Build: The Ancheer Magnetic Upright Exercise bike is one of the cheapest magnetic bikes you will find on the market today and we have included this bike as our budget option on the list. The bike is made of durable materials and can also be folded after use to save some space. This bikes is suitable to used in apartments and condos due to the small footprint and also less noise due to the magnetic resistance. While the bike is not heavy, ti still has a maximum weight limit of 250 lbs. This shows a lot of durabilities, but the bike does tart wobbling and feels a little unstable if you are heavy. Adjustability: With this bike you can adjust only the height of the seat. The seat can't be adjusted horizontally and the handlebars are fixed. 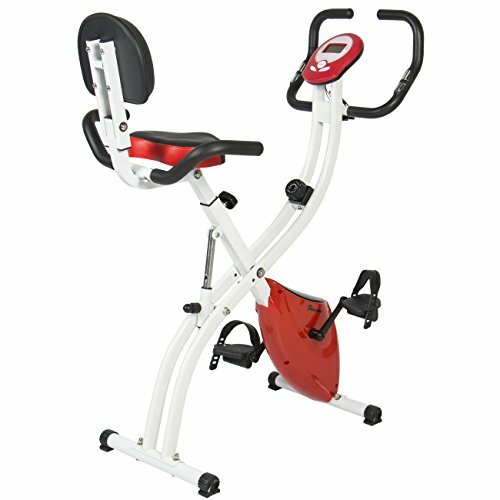 The bike comes with magnetic resistance, that uses magnetic force to cause resistance while working out. You need to turn the knob provided below the handlebars to adjust the resistance in. Console: The bike also includes a small LCD console to track all of the important stats and the hand pulse sensors will give you a decent read of your heart rate. In terms of pricing, we highly recommend this bike and we believe that it will be a great value investment. With this bike, you will still get a decent 2-year warranty and the bike itself doesn’t have any real maintenance for you to worry about. Furthermore, the assembly process is also quite easy and you should be rearing to go in no time. Last but certainly not least, we have the Folding Adjustable Magnetic upright exercise bike from Best Choice products and this bike is really a good investment if you like to vary your exercises from time to time. Build: The bike is designed from durable metal materials. The bike has an X-frame design allowing it to stored easily in a compact space. Moreover, the bike is only 40 lbs which is more portable. The frame of the bike is made of high quality steel. Adjustability: This bike also features 8 levels of magnetic resistance and all of them can be easily adjusted to get the right fit for your workout. The seat can be adjusted both vertically and horizontally with the pole and and preset holes. There are two fixed handlebars for this bike. The additional handlebar is at the sides of the seat making it easy for you to ride comfortably. The bike has magnetic resistance that can be adjusted by turning the knob manually. Console: The bike includes a built-in console that will allow you to track most of the important stats and the huge handlebar is ideal for varying your positions and transgressing from seated to standing cycling. In terms of pricing, this bike is also really cheap and affordable and no assembly will be needed. The bike does wobble a little bit after a while, but you might find some ways around this. We would highly recommend this bike due to the multi-functionality and the portability. If you are looking for a cheap option for the entire family to get started, this bike will be the best investment. Whether you are looking for a cheap spinning bike or a high-end one, these best magnetic spin bikes is the best way to go. With magnetic resistance, everything will be much smoother and you will not have as much maintenance to think about. In terms of recommendation, we would like to recommend the Keiser M3i. They put a lot of time and effort into their products to ensure that you get the best value for your money. Please share your thought on our selection in the comment section below and also let us know I you think we might have missed any of your magnetic spin bikes. We look forward to your comments and selections.